A few days ago, I was listening to the new Slum Village album, entitled “YES!”. More specifically, a track called “Tear it Down” which features Jon Connor. 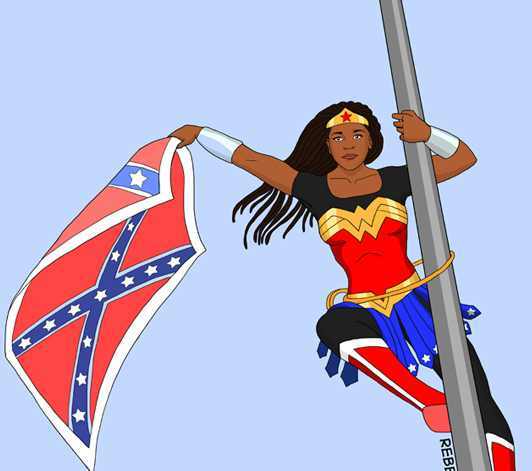 One of the first things that I thought about was Bree Newsome’s heroic climb to remove the confederate flag on the morning of July 27th. For many of us in the African-American community, this flag has served as a symbol of racial hatred, enslavement and all of the deplorable things which come with the “southern pride” that those who advocate the flying of the flag make excuses and a long-winded case for which is laced with double standards and a deep rooted history of devaluing Black lives and Black humanity in general. I don’t for one moment, pretend to approach this article from a stance of “objectivity”, but rather one of rebelliousness; a drop of the same liberation- seeking modus operandi which propelled Bree to courageously climb that pole and declare what the planet Uranus symbolizes: going against the grain, radical change, and freedom through shocking and awakening. Astrologically, Uranus is a planet which advocates tearing down whatever isn’t useful in existing structures. It’s the antidote to conceptual incarceration, or the confines of an overly rigid or culturally conditioned mind. Uranian energy is certainly the enemy of those who wish to advocate and uphold “the way things have always been” type of mentality. As we look at where Uranus sits in all of our birth charts, the message is clear that this is the place where we just can’t do things the “regular” way. Wherever and however Uranus is connected to our planetary makeup suggests where we’re motivated to move past limitations which may have gathered inertia-filled roots in age, gender, race, culture, sexual orientation and so on. In our natal chart, Uranian energy points to that genius inside us, the voice we must follow if we’re going to experience real revolution and not a contrived existence which features going along just to get along. If we decide to own and use these Uranian resources, we may soon feel a feeling of alienation, which is one of the only “normal” things that we can count on where this planet is concerned. The question we must ask ourselves is: do we want to live TRULY? The functional and constructive side of this energy is pointing us to a life of being who we are without pretense. It’s quality of detachment can assist us in letting go of what doesn’t serve us with lightning speed and making room for what supports the unique quality of our being. One of the gifts of the Uranian Archetype is wide awake awareness as a way of life. However, we must claim it. We have to go about the business of tearing down all of the “should’s” “shouldn’ts” which may have controlled our lives until this point. Many of us will be tempted to seek comfort in the safety of predictability, but the call to undergo deep “de-conditioning” will still remain in our charts, and this is possibly JUST the place where we could introduce something to the world which innovates and breathes new life into what’s decaying and needs that spark desperately. HOW and WHERE can you LIBERATE – and TEAR IT DOWN?